Name Thomas Littleton Powys, Lord Lilford. Birth 18 March 1833, Stanhope Street, Mayfair, London. Death 17 June 1896, Lilford Hall. Burial 20 June 1896, Achurch Church, Northamptonshire. General 4th Baron. Ornithologist, observer and collector. Education Harrow School. Christ Church College, Oxford University, matriculated: 1851. Father Thomas Atherton Powys, 3rd Baron Lilford (1801-1861). Mother Hon. Mary Elizabeth Fox (1806-1891). First Spouse Emma Elizabeth Brandling. Death 9 July 1884, Windsor district, Berkshire. Marriage 14 June 1859, St George's, Hanover Square district, London. Children Hon. Thomas Atherton (1861-1882). Hon. John later 5th Baron Lilford (1863-1945). Hon. Stephen later 6th Baron Lilford (1869-1949). Second Spouse Clementina Georgina Baillie-Hamilton. Father Kerr Baillie-Hamilton CB (1804-1889) Governor of Newfoundland. Marriage 21 July 1885, Cookham district, Berkshire. Notes on Thomas Littleton Powys, 4th Baron Lilford. 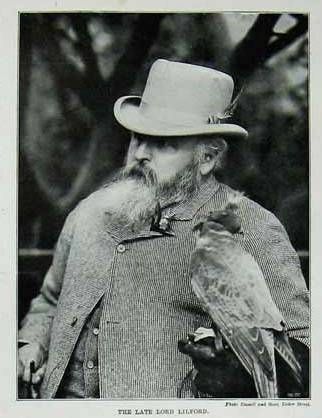 Lord Lilford was a British aristocrat and distinguished ornithologist. 1833 born 18 March at 14 Great Stanhope Street, Mayfair, Westminster, the eldest son of Thomas Powys, 3rd Baron Lilford, and Hon. Mary Elizabeth Fox, daughter of Henry Vassall-Fox, 3rd Baron Holland. 1843-1848 educated at Dr Bickmore's school, Berkswell, Warwickshire. 1848-1850 educated at Harrow School. 1850-1851 resided with a tutor at Lausanne, Switzerland. 1851 June 12, matriculated at Christ Church College, Oxford University, but left the university without taking a degree. 1852 elected a fellow of the Zoological Society. 1853 visited Isles of Scilly, Wales and Ireland, and took up falconry after he met Edward Clough Newcome the best falconer of his day. 1854 on the embodiment of the militia, Powys joined that of his county (Northamptonshire) and served at Dublin and Devonport, giving up his commission at the end of 1855. 1856 to 1858, accompanied by the Hon. Hercules Rowley, he made an extended yachting cruise in the Mediterranean. 1858 one of the eight founders of the British Ornithologists' Union. 1859 married, on 14 June, Emma Elizabeth Brandling (d. 1884), youngest daughter of Robert William Brandling, of Low Gosforth, Northumberland. 1861 succeeded his father as fourth Baron. He was initially a liberal supporter in the House of Lords, but became a Conservative after 1874. 1862 March, elected a fellow of the Linnean Society. 1864-1882 paid frequent visits to Spain and the Mediterranean, rediscovering the rare gull Larus audouini. Together with his friend Leonard Howard Loyd Irby, he was a pioneer in Spanish ornithology. 1867 President of British Ornithologists' Union for nearly 30 years until his death. 1874 discovered a new species of lizard, named after him as Lilford's Wall Lizard, whilst on visit to Minorca in the Balearic Islands, Spain. 1876 first President of the Northamptonshire Natural History Society, and a prominent member of the ‘Old Hawking Club’. 1882 death of his eldest son, the Hon. Thomas Atherton Powys, and in 1884 of his first wife, greatly distressed him, and his lifelong malady chalky gout, subsequently rendered him a permanent invalid. Although his hands were crippled by gout, he personally conducted a voluminous correspondence with scientists all over the world until shortly before his death. His affliction was somewhat relieved by the devoted attention of his second wife, Clementina Georgiana Hamilton (1839–1929), daughter of Kerr Baillie Hamilton CB Governor of Newfoundland, whom he married on 21 July 1885. 1896 died on June 17, aged 63, and was buried three days later at Achurch Church, near Lilford. Was succeeded in the barony by his second son the Hon. John Powys from his first marriage. Indeed he is even mentioned in the famous book "The Descent of Man" by Charles Darwin, where in Capter XIV on birds Darwin writes "When birds gaze at themselves in a looking-glass (of which many instances have been recorded) we cannot feel sure that it is not from jealousy of a supposed rival, though this is not the conclusion of some observers. In other cases it is difficult to distinguish between mere curiosity and admiration. It is perhaps the former feeling which, as stated by Lord Lilford,* attracts the ruff towards any bright object, so that, in the Ionian Islands, "it will dart down to a bright-coloured handkerchief, regardless of repeated shots." The common lark is drawn down from the sky, and is caught in large numbers, by a small mirror made to move and glitter in the sun. Is it admiration or curiosity which leads the magpie, raven, and some other birds to steal and secrete bright objects, such as silver articles or jewels?" Personnel wealth at death £53,278 6s. 10d (£4.5 million at today's worth) probated 7 Nov 1896, CGPLA Eng. & Wales. 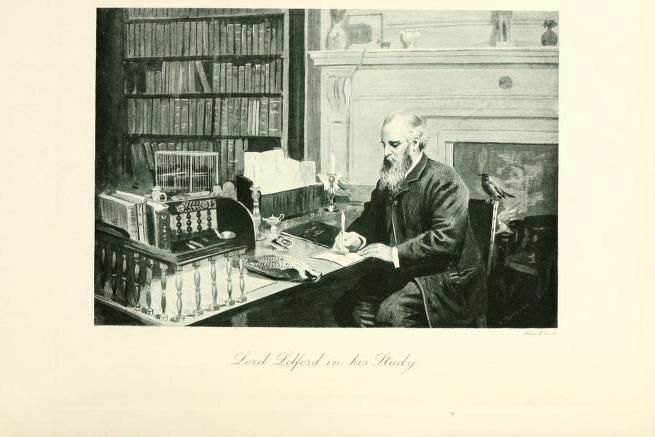 Lord Lilford inherited on the death of his father, the Lilford Estate (including Lilford Hall), the Holland Estate, and the Bank Estate (including Bank Hall), to become one of the richest men in England. 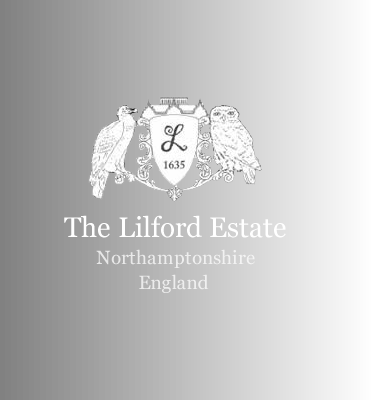 In 1883, the Lilford Estate consisted of 8000 acres, and the Bank Estate 7500 acres. At today's prices, the combined estates were worth around £80 million). B. 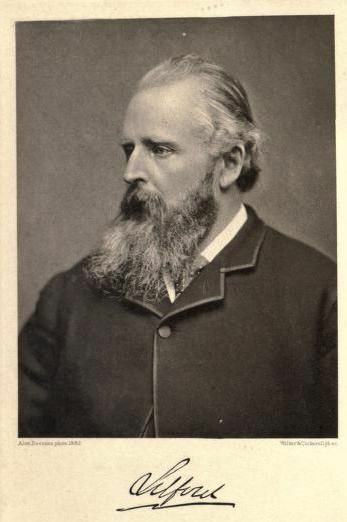 B. Woodward, ‘Powys, Thomas Littleton, fourth Baron Lilford (1833–1896)’, rev. Yolanda Foote ?????? ?